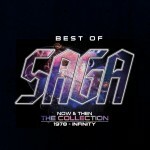 Share the post "Album review: SAGA – Best Of – Now And Then – The Collection"
A two CD best of released as a taster for the upcoming Saga re-issues due in the autumn. An interesting way to select the songs as it features one song from each of the band’s 21 studio albums to date. Sadly no bonus songs or unreleased songs for the fans, they are promised on the re-issues. Saga have never enjoyed the same success as fellow Canadians Rush and Triumph, although they have always enjoyed a good following in Europe (they are massive in Germany and their last two albums charted in the top 20 albums chart) and to a lesser extent the UK. What sets Saga apart are the highly melodic vocals of Michael Sadler and the band’s knack of mixing prog/rock with a pop sensibility. Even early on in their career they had pop rock songs like ‘On The Loose’ and by the mid-80′s they were the kings of hi-tech, synth led AOR/melodic rock with albums like 1985′s ‘Behaviour’ and 1987′s ‘Wildest Dreams’. The band had one album without Michael Sadler, 2009′s ‘The Human Condition’ which featured Departure’s Rob Moratti on vocals. ‘Step Inside’ is the song choice from that album. The best of is right up to date with ‘I’ll Be’ off the band’s latest album to date, ‘Sagacity’ released in 2014. Fans will doubtless spend many a happy hour debating on the song choices as one of the band’s hits, ‘The Flyer’ (okay it reached no.79 in the US) is absent and personally I’d have picked a few more quirky songs form the band’s back catalogue. This entry was posted in ALBUM REVIEWS, ALBUM REVIEWS (Mobile), All Posts and tagged album, best of, classic, melodic, Michael Sadler, Now And Then - The Collection, prog, progressive, review, Rob Moratti, rock, Saga. Bookmark the permalink.